54" x 32" steel framed glass backboard with aluminum trim. 1/4" thick tempered glass backboard for superior rebound. Two Piece, 4" Square steel pole allows for maximum stability. Ground sleeve anchor system allows for easy installation. Basketball is one of most famous sports in the globe, also having one of the biggest fans, being one of the widely viewed sports in the world. You can play it in any weather and you can choose to play it either indoor or outdoor; on a half or full court. It is a sport for everyone. Even for those who just want to sweat and play. Who does not know about Michael Jordan or Kobe Bryant or the NBA? All the world went to watch Kobe at the final day of his career in NBA. The National Basketball Association or the NBA is not only the most popular league for basketball aspirants but also considered as the highest level of professional basketball in the world. So if you also want to play like a Pro like these NBA idols, here is the Spalding NBA In-Ground Basketball System – 54″ Aluminum Trim Glass Backboard, made by the official basketball and backboard of the NBA. 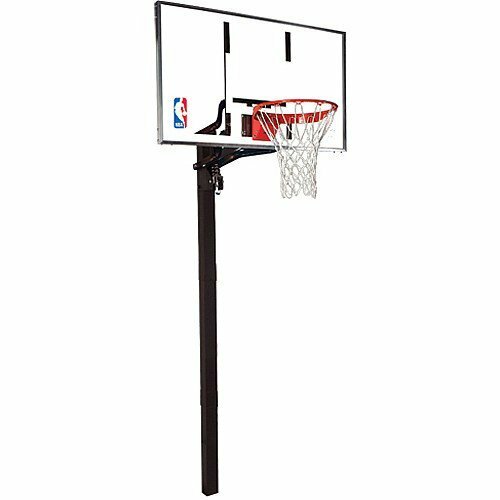 54 x 32 steel frame glass backboard – the glass provides the best rebound performance and the steel frame is ideal for competitive play. Two pieces, 4-inch square steel pole – the steel provides extra strength to endure any weather condition. U-lift system technology – for infinite adjustments to the rim from 7.5 to 10 feet. The backboard is offset from the pole by 2 feet – so you can shoot below the basket. Spalding Pro Image Rim – can withstand even the heavy dunks, for that show stopper play. Official NBA logo – for the NBA feels. It is glass, thus, will result in more bounce compare to acrylic or polycarbonate or various other composite materials. The U-lift system is adjustable from 7.5 to 10 feet. The Backboard is offset from the pole which means more playing space, more fun. An adult may be needed in installing the products for children though teenagers may do it so without any help. The 2 pieces can be a little hard to install together but sure enough, the assembly of the brackets, backboard and hoop are as easy as the breeze. This in-ground goal is assured to withstand hard weather and heavy dunks, tried and tested by many previous buyers. Fun to play basketball with and to live to NBA dream. If you want to play basketball in the convenience of your home, this in-ground basketball hoop is the best one to install. It is cheaper compared to its higher-end counterpart but is competitive enough to play ball with, considering the materials chosen to build this product. It is built next to the standard of the NBA. It has very little to no wobble at all so you need to not worry if you play hard and wish to try a dunk on it. It is perfect for kids and teenager and adults to play around or to practice and enhance their skills. Definitely, It is a good investment for those who thinks the ball is life. Spalding brand does not compromise as it is the official provider for most of the biggest leagues and association worldwide, including the NBA. We have made a list about the best in-ground hoops on the market.